On behalf of the European Climate Foundation, Carbone 4 has assessed the carbon footprint of various types of passenger cars within the European Union. This study is an addendum to our previous work on life cycle analysis of vehicles in France. In this extension, Spain, the United Kingdom, Italy as well as the average for the European Union were considered. Different electrified vehicles are compared to internal combustion engine vehicles (ICEVs): plug-in hybrid vehicles or battery electric vehicles, including an electric vehicle with a range extender. The carbon footprint assessment is carried out over the entire life cycle of the vehicles, that is to say taking into account the use but also the manufacture and the end of life of the vehicles and their battery. The study shows that electrified vehicles systematically emit less greenhouse gas than ICEVs nowadays, both in each of the 3 countries studied and at European level. For example, an electric city car in Europe emits half as much greenhouse gas as a gasoline vehicle. This difference is less pronounced for sedans with an advantage of a quarter on a European scale. 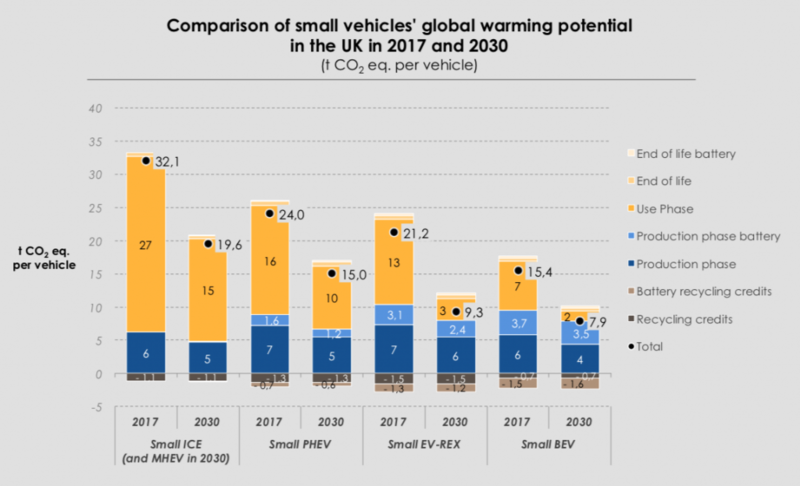 The case of the United Kingdom is representative of the common finding throughout Europe: the battery electric vehicle halves the carbon footprint of a city car compared to a ICEV, and an electric sedan car produces 25% less CO2 emissions than an ICEV of the same segment. But above all, the study reveals the significant potential for reducing emissions from electric vehicles in this country, showing how the development of electric mobility can benefit from the energy transition of the electricity mix: thanks to the reduction in electricity production from fossil fuels, the carbon footprints of battery electric vehicles in the United Kingdom are down by 50% (for city cars) or even 60% (for sedans) between 2017 and 2030.